New Delhi: In a radical departure, the new 15-year long-term vision being worked out by the NITI Aayog would also include defence and internal security within its ambit, V.K. Saraswat, a member of the panel that has succeeded the Planning Commission, said on Monday. Saraswat said the NITI (National Institution for Transforming India) Aayog would pitch for long-term planning of various policy-related issues of internal and external security rather than looking at micro and macro plans. "Its role would be related to strategic analysis of those aspects of security which are dependent on other aspects like external affairs, economic issues and technology issues," Saraswat told . "In the present configuration of our country's planning process, with the NITI Aayog's formation and with the distinction between plan and non-plan expenditure completely removed, all sectors of country's economy have come under the same umbrella," the former Defence Research and Development Organisation (DRDO) chief added. 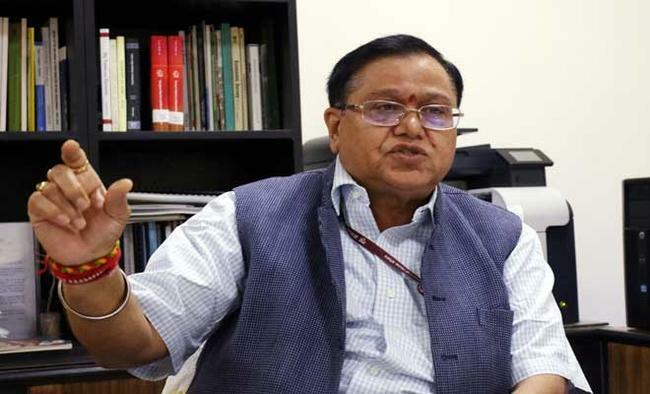 Even so, the major part of the defence planning process would still remain under the ambit of the armed forces and the Defence Ministry, Saraswat said. "But certainly, like we are doing in case of all other ministries and other domains, we would certainly be pitching in with respect to various policy related issues." "It will be in that direction that NITI Aayog would play a role as far as security and defence are concerned," he said.NITI Aayog on Sunday presented a draft of the three-year action agenda for the nation's development at the planning body's Governing Council meeting here. Apart from the action agenda, there would be a seven-year strategy and a 15-year long-term vision that would replace the erstwhile Five-Year Plans for the nation's planning framework. The 12th Five-Year Plan ended on March 31.Saraswat said that for the "New India" that the nation is aiming for, there is a need to build a long-term vision. "That's why we are working on a 15-year vision. Once we have that, we need a strategy which leads to that vision." He said this strategy would be adopted over the next seven years. "And obviously, we have to do the immediate. So we need an immediate action plan carved out of that seven-year strategy" which defines the main priority areas, Saraswat added. While sharing the outline of the three-year immediate action plan on Sunday, NITI Vice Chairman Arvind Panagariya said over 300 specific action points have been identified covering the whole gamut of sectors.Saraswat said the identified action points cover education, health, industry, communication, mobility, travel, housing and many other fields which would become the government's priority sectors. "One major issue we have identified is how to double the income of the farmers. My colleague Dr Ramesh Chand has spent last six months in finding what we can do to achieve that. "Saraswat said other identified issues include improvement of the healthcare set-up by introducing the concept of e-health and improving quality of education to lay emphasis on innovation. "All such actions need to be planned and hence form part of the three-year action plan. "Asked about the need to move away from Five-Year plans instead of incorporating all these measures within the earlier framework, Saraswat said there was a need for "long-term planning with a short-term modular action plan". "When you look at five years, you don't look at the 15th year. Here we have a very specific agenda (for 15 years) and to reach that vision, we have a strategy and an action plan." He said that when the three-year period ends in 2019-20, another action plan would be conceived to take it forward. "That's because we are looking at attacking problems which are required to be solved immediately" while also achieving the long-term vision, he said.While the draft of the three-year plan was shared with the Chief Ministers of states at NITI Aayog's Governing Council meeting on Sunday to seek their views, the seven-year strategy and 15-year vision are in the making. During his illustrious career, Saraswat, one of India's most accomplished scientists and researchers, worked as the Scientific Adviser to Defence Minister, Secretary to the Department of Defence (R&D) and the DRDO chief. He was associated with the development of liquid propulsion rocket engines and missiles like Prithvi, Dhanush and Prahaar.